Malaria is a serious and potentially life-threatening disease of the blood, approximately a million-people die from it every year. In Africa, a child dies every 30 seconds from malaria. Fortunately, malaria is preventable and can be treated. The symptoms of malaria typically start 1-4 weeks after being infected. Malaria is caused by a microscopic parasite called Plasmodium. Plasmodium is transmitted between people from infected mosquitos. The mosquito is the deadliest animal in the world and kills more people than dogs, snakes and sharks. As well as malaria, mosquitos transmit diseases like dengue fever, Zika virus and yellow fever. A mosquito is tiny, but when it bites a person infected with malaria a small amount of blood is taken in which contains tiny malaria parasites. About a week later when the mosquito takes its next human victim the parasite mixes with the mosquito’s saliva and is then injected into the person being bitten. The parasite then travels to the liver, where it begins to multiply, from there the parasite travels to the red blood cells, destroying the cells causing them to burst and releasing more parasites. As malaria is found in red blood cells it can also be transmitted from a blood transfusion, sharing needles, organ transplant and from a mother to her unborn child before or during birth. No, malaria is not spread from person to person like the cold and flu and can’t be contracted through sexual activity. The symptoms of malaria typically start 1-4 weeks after being infected. However, it can sometimes take up to a year before symptoms develop. So, it is very important that if you have travelled to a country with malaria and you develop fever, or flu like illness, up to 1 year of returning, then you should see your GP and ask to be tested for malaria. Symptoms of malaria are similar to those of the flu , such as high fever, chills, sweats, headache, muscle aches and tiredness. You may also experience nausea, vomiting and diarrhoea. Malaria may also cause jaundice and anaemia as result of losing red blood cells. Symptoms usually come and go in 48-hour cycles as the blood cells burst and can last between 6-12 hours. What are the different parasites I can be infected with? Plasmodium vivax- this is most common in India, Central and South America. It has an incubation period of 8-10 days. With this form you can develop anaemia and rupture of the spleen. P. ovale – this is fairly uncommon. This form of malaria has an incubation period of 8-17 days. This form is rarely life threatening but can cause anaemia. P.malariae – this is quite rare and usually only found in Africa. This has an incubation period of 2-4 days. P.falciparum – this is the most common and is also the most life threatening form of malaria. This parasite has an incubation period of 5-12 days. Drug resistance is becoming more widespread with this form of malaria. This form can cause severe haemolytic anaemia, which causes the blood cells to be destroyed and so can cause breathing difficulties and organ failure. P.knowlesi – this has only recently been found to cause infection in humans, it is very rare and is found in south east Asia. Am I at risk of suffering with Malaria? Anyone can get malaria; however, you are at the most risk if you travel to countries where malaria is present. Africa is where 90% of malaria deaths occur and most of these are children under 5. The parasite, plasmodium falciparum is the type of malaria that causes severe and life-threatening conditions. What countries am I most at risk of getting Malaria? Malaria is typically found in approximately 100 countries over the world, mainly in warmer climates. Hotter temperatures allow the female anopheles (a specie of mosquito, also known as the malaria mosquito) mosquito to thrive. The malaria parasites which develop and grow inside the mosquito need warmth before they are mature enough to be transmitted to humans. The parasite is most commonly found in tropical and sub-tropical areas such as Africa, south of the Sahara Desert, Asia and central/south America. There is no immunisation available for malaria so for people travelling to countries where malaria exists, prevention is key. Before travelling visit your doctor or a travel clinic for advice. There are a few different types of anti-malarial drugs available, the type you should take will depend on the area you are travelling to and your individual circumstances. No one type of recommended anti-malaria tablet works better than another. Some are daily tablets, some weekly. Some are started a few days before travel, others 7 or 10 days before. To find out if you require anti-malarial tablets and which ones are recommended for the country you are travelling to then you should visit the NHS travel website: Fit for travel. Anti-malarial drugs such as chloroquine that was once the drug of choice is becoming largely ineffective in most parts of the world as the deadly pararsite, P.falciparum has developed resistance to the drug. 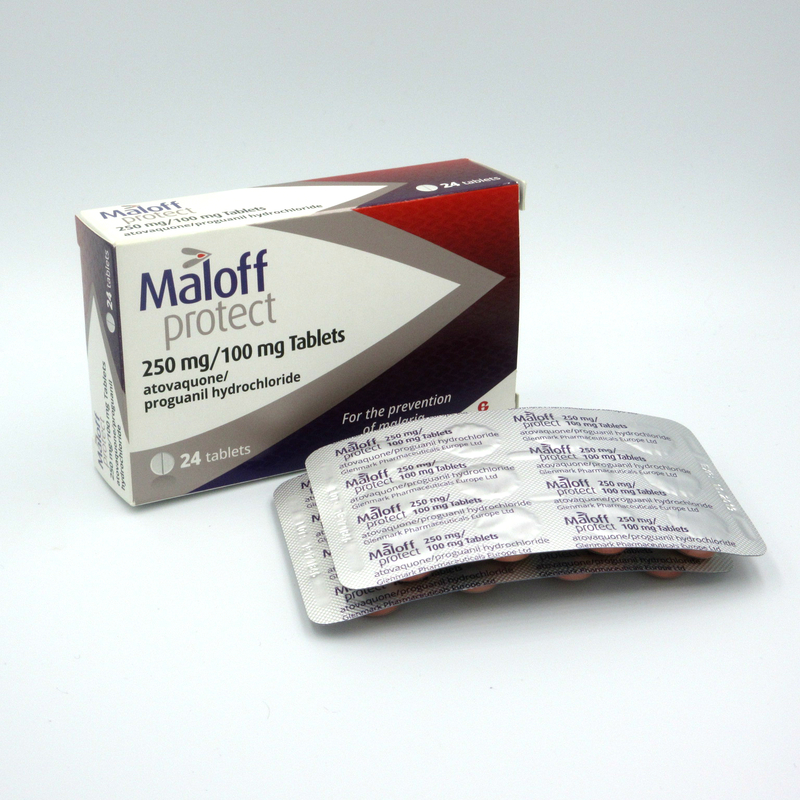 Some anti-malarial tablets are now available online or from your GP or travel clinic where you can obtain a private prescription. However, you should be aware that doctors will charge for private prescriptions, usually £8-£20 and this can be even more expensive in some areas. Atovaquone/proguanil, these are the active ingredients that provide effective protection against malaria, it works by killing the malaria parasites in the body. This drug is for adults only, unless it has been prescribed by a doctor. This drug is taken orally and can be taken 1-2 days before travel. Dosage is 1 tablet taken at the same time each day, where possible take with food or a milky drink. Continue to take the drug during your abroad travel and for 7 days after you return, it is very important that you take the full course. If you are sick(vomit) after taking the tablet then you must take another one straight away. This drug is not suitable if you are allergic to any of the ingredients or have kidney or liver disease. There are many possible side effects of this drug some of which include sleeping problems, dizziness, strange dreams, depression, fever, rash, loss of appetite, cough, sickness, diarrhoea or allergic reactions. If you suffer a severe allergic reaction you should contact a doctor immediately. Ensure you read instructions fully before starting the course. If you stop taking this drug or you suffer sickness or diarrhoea then you should continue to protect yourself from mosquito bites. Doxycycline is an anti-bacterial medicine. The recommended adult dose is one, 100mg tablet per day. One or two doses should be taken before departure. It should be continued throughout your trip and for 4 weeks after you return. It is very important to complete the course. Try to take your tablets with food and at the same time each day. If you miss a dose, take one as soon as you remember then carry on as before (you may have to get more tablets). Never take two doses at the same time. Reflux problems are common if capsules release their contents into the gullet and so they should be taken with a full glass of water. You should also take the tablets while standing upright and not just before going to bed. Side effects may include: anorexia, nausea, diarrhoea, thrush, sore tongue (glossitis), headaches, blurred vision or tinnitus. Doxycycline will often cause an increased sensitivity to sunlight, meaning you may be more prone to sunburn so a high factor sunscreen and a hat is important. If the reaction is severe then alternative anti-malarials should be used. Mefloquine is used to prevent malaria by killing the parasites once they enter the red blood cells and preventing them from multiplying. 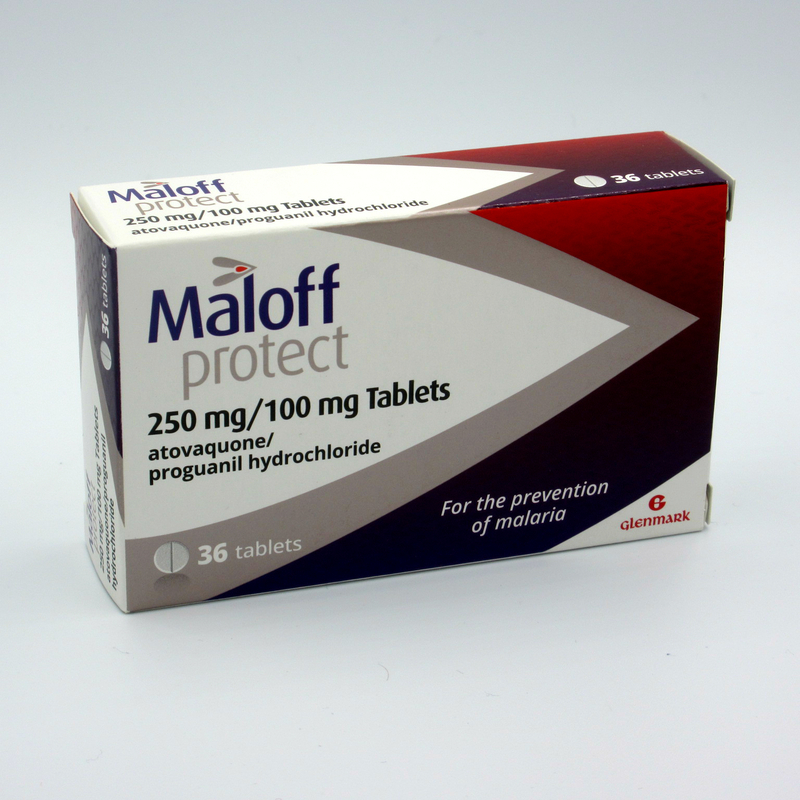 Unlike other anti-malarial tablets this tablet is taken just once a week. It is important that you take on the same day the week after. You should take the first dose a week before departure and it should be continued throughout travel and for 4 weeks afterwards. However, if you have never used this drug before it is recommended that you take three (3) doses at weekly intervals prior to departure so any side effects can be identified and an alternative drug prescribed. The tablets need to be taken with food and plenty of water at the same time on the same day each week. It is very important to complete the course. Mefloquine is unsuitable for those who have a history of severe liver disease, depression, generalized anxiety disorder, psychosis, schizophrenia, suicide attempts, suicidal thoughts, self-harming behaviour or any other psychiatric disorder, epilepsy or convulsions. Side effects may include sleep disturbances, strange dreams, nausea, diarrhoea, dizziness, abdominal pain, rashes, itchy skin, headache, dizziness, convulsions, and psychotic reactions such as depression. As well at anti-malarial drugs it is also advisable to avoid being bitten, mosquitos bite predominately after sunset and at night, however, they can bite anytime. Use mosquito repellent, one which contains DEET are among those that are most effective. Repellents come in the form of roll-on’s, sprays, sticks and creams, ensure you re-apply it frequently. You should sleep under mosquito nets and for extra protection spray them with a fabric spray containing permethrin. Keep the area you sleep in cool with fans or air conditioning, weak winged mosquitos struggle to fly if there is a breeze and don’t like the cooler temperature. You should also wear pale coloured, loose fitting, long sleeved tops and trousers, especially if outside at night. Hot climates and long sleeves are not ideal so choose linen or lightweight materials, if the clothes are very thin mosquitos can bite through them so stay protected. There are clothes available that contain permethrin or there is a spray available to use on clothes. If you live in an area where malaria is a problem then you can also spray insecticides on your walls and furniture to kill the mosquitos. You should also try to invest in screens to go over windows and doors. What is the diagnosis of Malaria? If you suspect you might have contracted malaria then you should seek medical advice as soon as possible, symptoms can get worse very quickly. Your doctor will ask where you have travelled, ensure you mention any stopovers also. Your doctor will probably perform a physical examination to feel if the liver or spleen is enlarged. Your doctor will then perform blood tests to see if you have malaria and if so what type. The blood will be examined under a microscope and results should be available the same day. If you test negative you will require 2 further blood tests to ensure malaria is not present. We have malaria tests available on our web-site. Malaria should be treated early before it becomes serious and life threatening. Your doctor will prescribe a drug or combination of drugs straight away. The type of drug and length of time you will need to take it will depend on the type of malaria you have, your age and if you are pregnant. If your symptoms are mild then you may be able to be treated at home but if you have been infected with the p.falciparum parasite then it is likely you will need to be monitored and treated in hospital. What are the long-term effects of Malaria? If diagnosed early, you have no other severe illnesses and are treated effectively then you shouldn’t suffer any long-term effects. If malaria is left untreated then it is more likely to be life threatening. Recovery time from malaria will again depend on the type of parasite you are infected with and the severity of your symptoms. The types of malaria, P. ovale and P. vivax, can lie dormant in the liver for weeks, months or even years, leading to relapse at a later date. 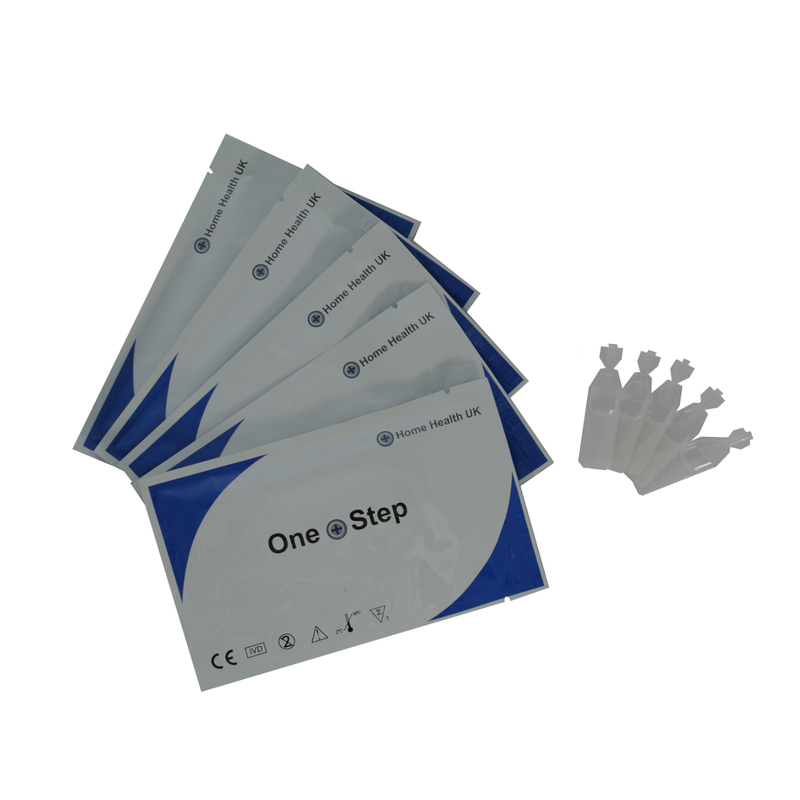 There are medicines available to prevent relapses from occurring. Isolation is not necessary with patients with malaria and they do not need to be excluded from either work or school, as the disease is not contagious. If you do have a history of malaria you should not donate blood or organs.